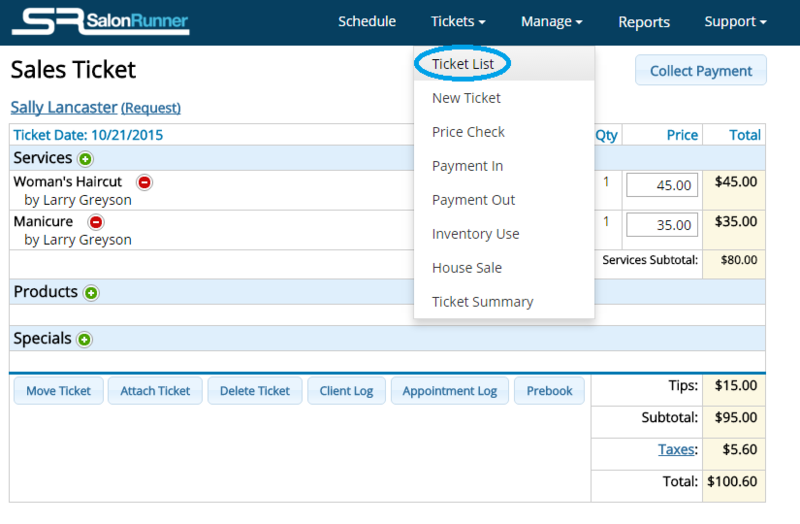 Sales tickets are automatically created and appear in the Open Tickets column on the Tickets screen when the client is checked in. All services and their prices are shown on each ticket. Use the buttons on the ticket to add products, services and specials, access the client and appointment logs, attach or move tickets and pre-book appointments. If at any time you’re interrupted or need to look something up, you may click on the “Ticket List” button to return the ticket screen to the Open Tickets column and start over where you left off. A client may get an extra service that wasn’t scheduled (for instance, a manicure while her color is processing). Sometimes a scheduled service changes (trim instead of full haircut for instance), so you’ll also need to cancel the original service (just click the red icon next to it) before adding the new one. Click the button on the ticket and follow the simple onscreen instructions. For full details, see Add Services to a Ticket. There are many ways to add products to a sales ticket. A pop-up may remind you that the client is running low on a product they usually buy, or suggest a product promotion tied to the services performed that day. Both provide pop-up order forms. You can click the button or add products through the Client Log. Or products may have been added to the ticket because the client reserved them when scheduling online and opted to add them at check-in. For full details on adding products, see Add Products to a Ticket. Purchase gift certificates, packages and memberships. See separate detailed descriptions and instructions for each under Gift Cards, Selling/Redeeming Packages or Selling/Redeeming Memberships. This combines two or more tickets for payment by one person (for instance, a mother and daughter both get haircuts and the mother pays for both transactions). You must have a separate ticket for each individual and then merge them at Checkout to maintain the accuracy of client and employee records. Follow the simple onscreen instructions, or for more details see Attaching Tickets. It’s sometimes necessary to move a ticket to a future date for payment, for instance when an appointment goes overtime and you’ve already balanced the cash drawer. Click Move Ticket, select a date for payment (or use the “tomorrow” quick link), and click Move Ticket. The ticket will be moved to the date you selected to be paid at that time. This is a listing of the Timestamps that will let you know the Description of what was done and By whom with the Timestamp of the date it was done on. Many clients like to book their next appointment before leaving, especially in very busy salons or during holiday periods to insure they’ll get the date and time they want. For full details see Pre-Book Appointments. The Client Log is a convenient tool that allows you to provide the personal touch for great customer service. It’s a record of the client’s past services and product purchases, future appointments, memberships or packages, gift certificates, notes and formulas. You can look up client history, add new products to the ticket, and add notes to be read the next time the client books an appointment. Click the Client Log button and then the appropriate tab. You may discount any service or product at this stage of checkout. The method used to enter the discount determines whether the books are balanced and employees are properly compensated. There are a number of ways to do this, depending on the situation and reason for the discount. Please see Discounts for details. When the ticket is correct with all additions/corrections (or none), click Collect Payment at the top. It will take you to the final checkout screen to assign the payment method, collect and close out the ticket.